I discovered Swap-Bot from reading a comment on Janette Lanes Pocket Letter site http://www.pocketletterpals.com and it got my curiosity, so I thought I would join to trial it out. 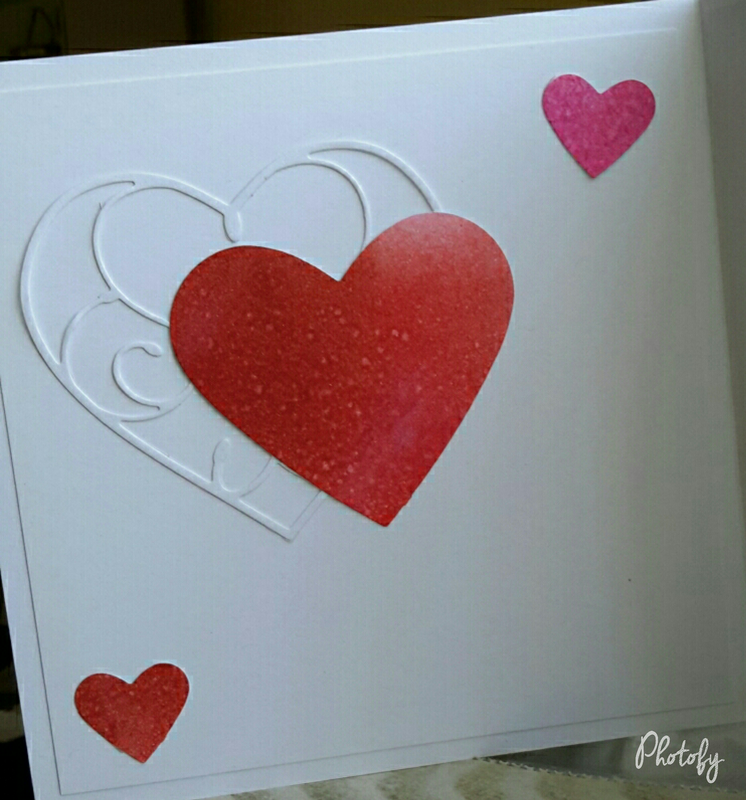 My first snail mail was a card making challenge with circles. Your swap partner is assigned to you by the co-ordinator, and you make the card according to the template of the event. I sent a message to my partner letting her know I am her partner and will endeavour to complete the card and send off by a certain date. 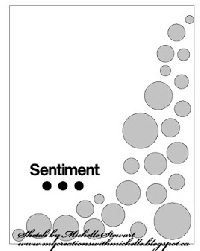 Once I have completed the assignment, I mark off the event as “Sent”. When my swap partner receives my card, I will be rated according to the Swap-Bot system and my swap partner optionally sends me a message. I like the rating system in that the challenge has been met and any extra ratings is a bonus. There will be another partner assigned to me and that partner will make a card for me. I will be given the opportunity to rate the card too. This is my card I made for my Swap-Bot partner. I made a matching envelop to go with it. When I saw Natalya’s video on her artwork using recycle material, I had to give it a go. As part of Nathalie’s Creative Jump Start 2017, Natalya’s take is Reduce, Reuse, Recycle, Stitch. It was very inspiring. There are so much plastic shopping bags out there, wouldn’t it be nice to somehow reuse or recycle it. The base was a light thin foam which I am sure was packaging. Then I glued layers of grey and red plastic bags that I cut into squares or rectangles. I drew a design on tissue paper and tacked it on the plastic layers. Then embroidered following the design. When done I tore off the tissue paper. Next one I will add a bit of bling to it. Maybe some sparkly thread. This one will go to a penpal as part of our recycling theme. Thank you Natalya and Nathalie. It was an enjoyable session. When I first heard that Creative Jump Start was happening again in January, I quickly jumped at the chance to register for 2017. The 2016 CJS (Creative Jump Start) course was amazing with the talented artists showing many techniques in painting, drawing, mixed media etc. Its so worth the money and its not expensive, really! Every participant is inspiring and you learn heaps. So do your self a favour and register as its not too late to do so. 2017 theme is Mix, Match, Master. Here is my first take on lesson #1 with Marsha Valk. 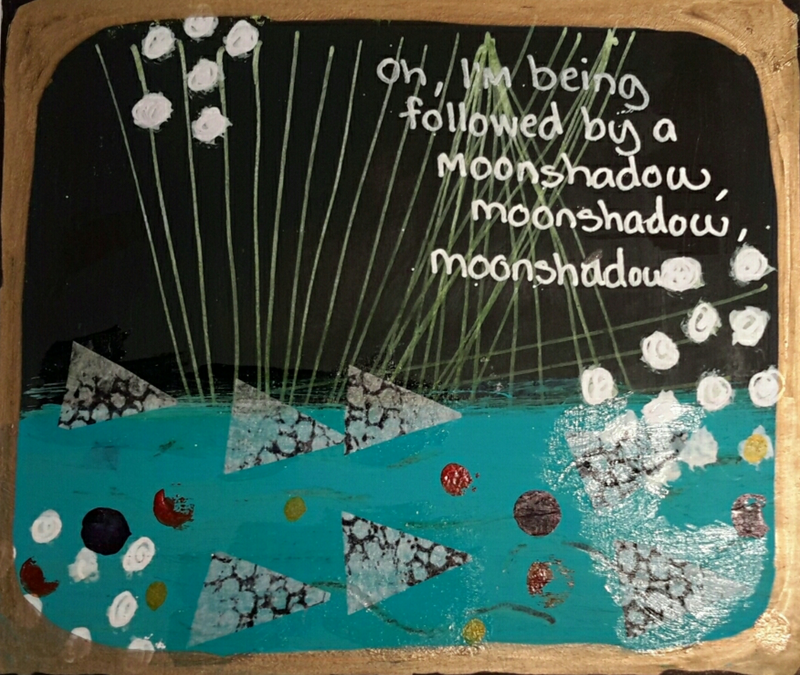 In my versions I used Gelli Plate, Gesso, Sharpie pens, Acrylic paint, Watercolour paints, Tissue Paper, Stamps, Gel Medium and Packing Tape. I dont have black gesso, so I used white gesso and then painted black acrylic paint over it. I can see that Sharpie pens are going to be my best friend! Again, I am keeping all my CJS creations in a book. I’ve recycled a Harcourts Real Estate booklet that can hold 16.5 X 23.5cm pages. Perfect size for me to use in this course. Pages are nice and thick. It is glossy, but I use white stock card for my art and then glue it onto the pages. I could also gesso the pages too. I also decided to add pockets to the pages if I needed them to store excess embellishments etc for that lesson so I dont lose them. Plus if I feel the art work needs more ‘mastering’ then I still have some of my supplies! I just loved how the four pieces turned out. Thank you Marsha! Nathalie, thank you for having Marsha on the team! Oh, I really should finish CJS 2016! The good thing is that I still have access to those videos! All I was thinking when I was watching the video lesson was “Moon”, “Stars”, “Cosmos” etc. The words on each piece are song lyrics and a quote. Song lyrics from Cat Stevens, Madonna and Frank Sinatra. Quote from Carl Sagan. I have not used my Big Shot die cutter in a while and had the opportunity when I needed to make a wedding card for my high school friends daughters wedding. 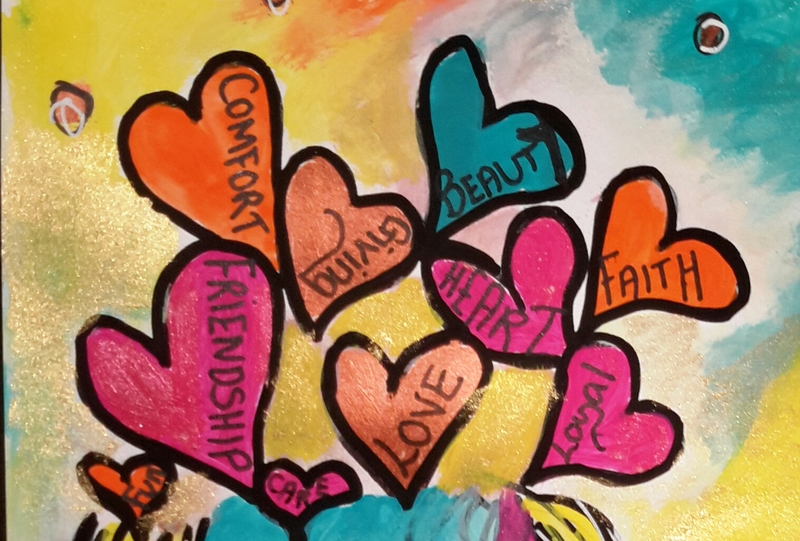 The heart was made with distress ink. I love the bright colour. Spritzed with water. Vine leaves die cut. Every week we have delivered in our letter box The Weekly Times newspaper which features rural news of Victoria. There are always plenty of photos of animals in the paper, so I decided to use some of them for my little cards. 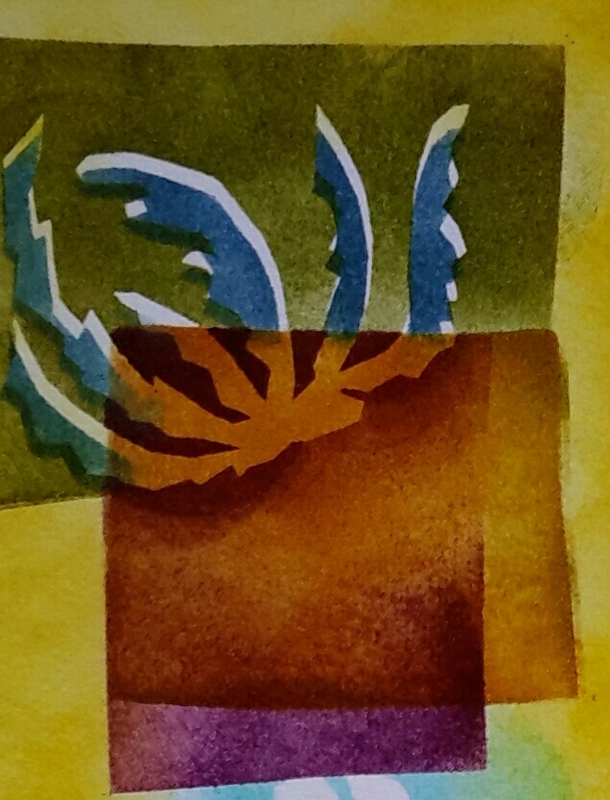 For the background I used Distress Inks and spritzed with water. I tore out the photo from the newspaper and used medium gloss gel to adhere the photo to the background. I loved how it turned out. I gave this set to a Pocket Letter Pal in Australia. I hope she appreciates them as much as I did. The pocket letter theme was “Take A Page” where your background is from a page of a text book, magazine etc. My background was from the newspaper regarding a story on the diary industry in Victoria and supporting the local diary industry by buying milk directly from the farmer. Pocket Letter featuring the Jersey cows. 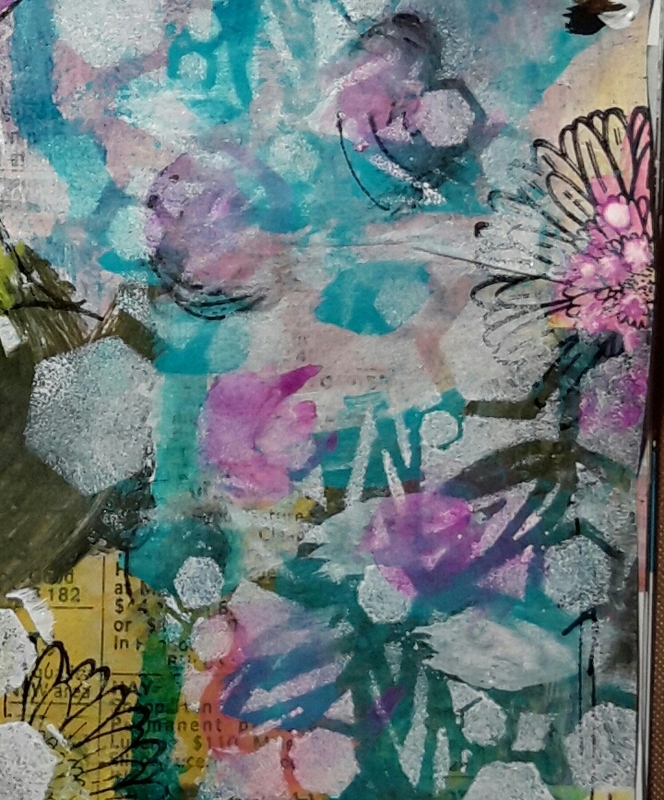 Mixed Media layout using photos, stamping, water colour, distress inks and a bit of stencilling. I love this months Jot Magazines Mood Board Challenge of blues and greys. 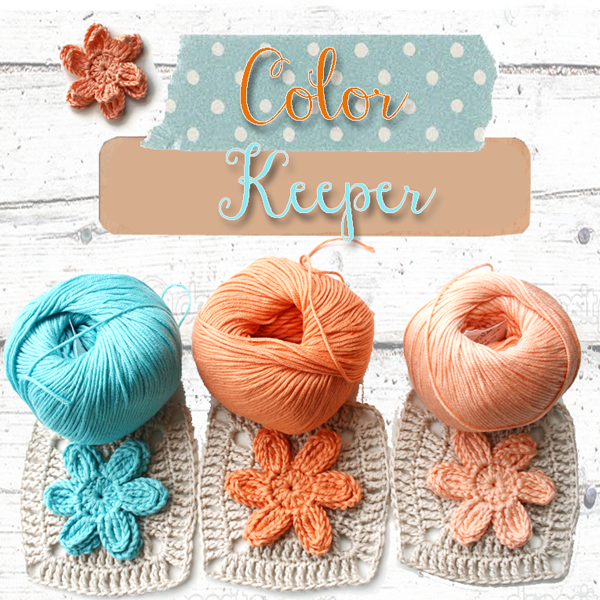 Their challenges are always inspiring and I just love the colour combinations. I chose a fun photo to scrapbook and thought the colours would suit. 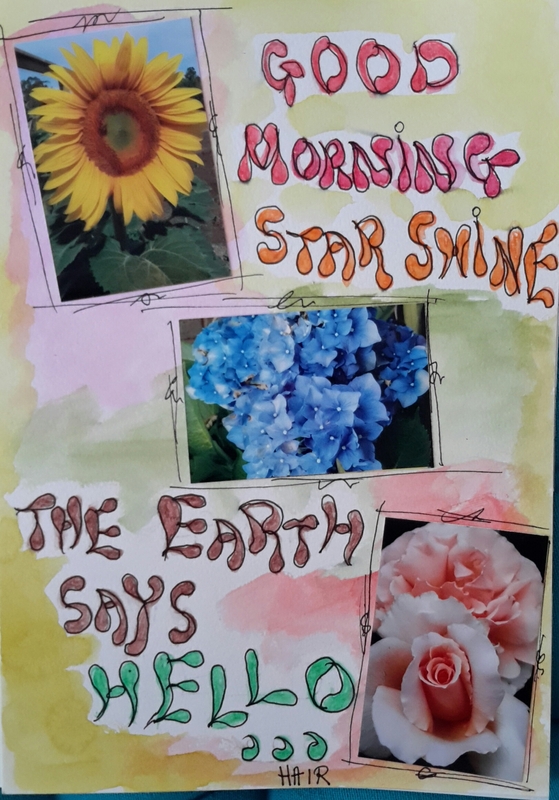 Its a mini scrap book page of about 14X14cm. We found his old safety glasses in the barn while tidying it up. The lens flip up. 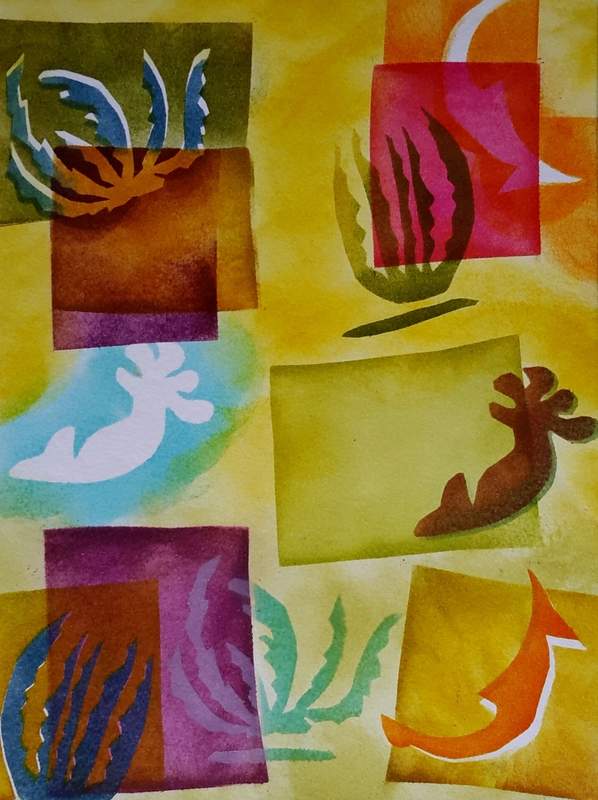 I splashed distress ink for the background and used some leftover scraps of gelli prints (brown and blue) and blue acrylic paint stencilled with paste. I added some unused yarn and washi tape. Thanks again Jot Magazine for the challenges. Love seeing them and participating when I can. I discovered Pocket Pal Letters early this year in March 2016. 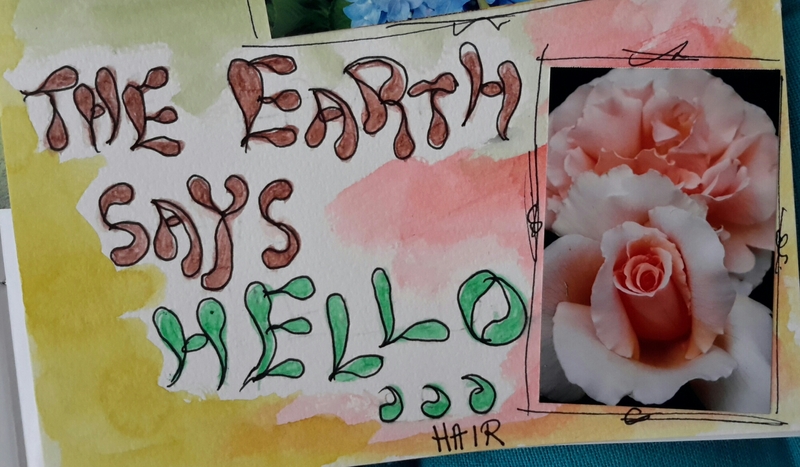 Besides the opportunity to write to Pen Pals from all over the world or just locally in your country, you create mini cards (9X6.5cm) that fit into a pocket of nine. Its a plastic sleeve that holds collector cards that you can buy at EB Game stores in Australia or online stores like Ebay or Amazon. be added. A letter is included and tucked into one of the pockets. The Pocket Letter folds up easily and is then sent to your Pocket Letter Pal in a standard 10 size envelope. It’s the perfect way to send and collect letters from other Pocket Letter Pals (i.e. people who are sending mail in this format) around the world. They also fit perfectly in a binder for easy storage! This can be a one-time exchange or you can swap Pocket Letters indefinitely. If your into paper crafts, card making, art journalling, mixed media etc, you can apply these techniques to Pocket Letters in miniature form! My techniques to creating the Pocket Letters are varied. I love writing a short letter and getting to know my Pocket Pal. You can join in events which is a theme for a Pocket Letter or search for a group that interests you and find a Pen Pal with similar tastes. January is always a busy month with summer in Australia, lots to do like watching the Australian Open tennis in Melbourne, Australia Day festivities, gardening outside, catching up with friends etc. I used a photo from my good friend as inspiration. I will give her the original and print a copy for myself. I love how it turned out. 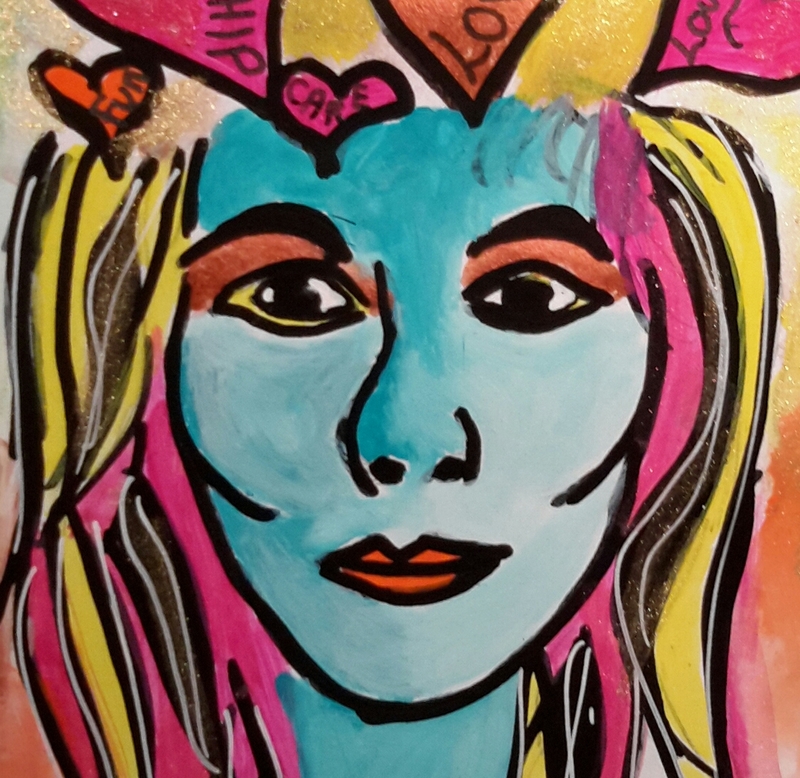 I love how Birgit used bright colours and black pen to draw her portrait. 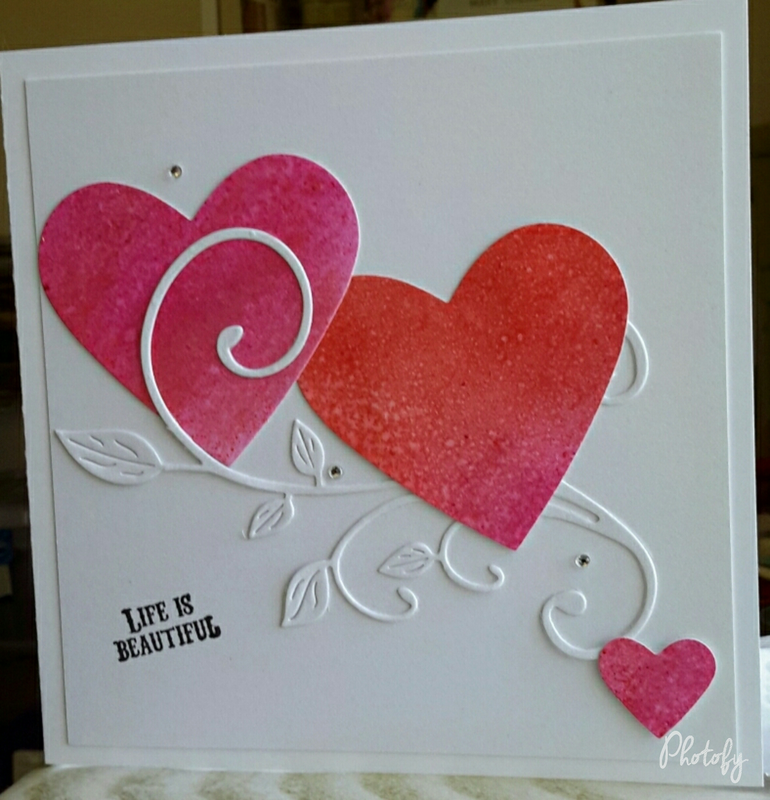 So thankful that Birgit was able to show this lovely technique. Thank you Birgit! I used Jo Sonja’s acrylic paints, Sharpie black and white pens and some gold and pinkish shimmer for a bit of sparkle. After a long weekend break down at Port Arlington, staying with friends and enjoying the Mussel Festival, I am slowly catching up with Nathalie’s Creative Jump Start 2016 sessions. I enjoyed watching how Joanne easily created her style of letters / fonts. 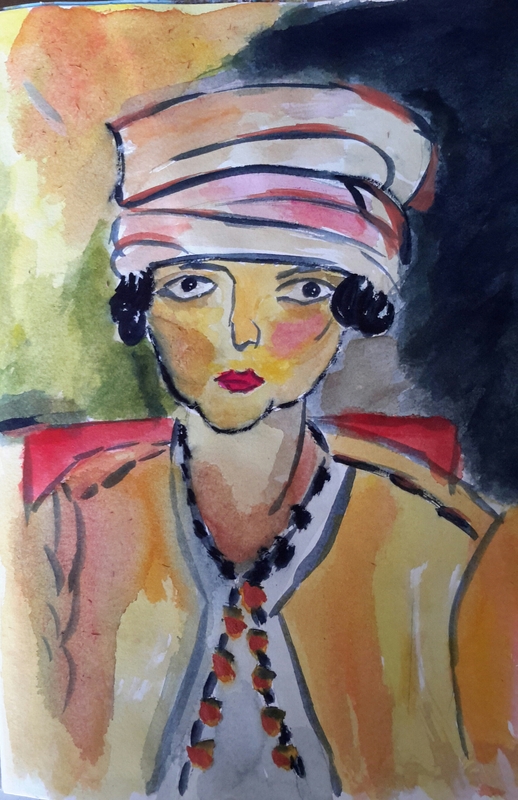 I gave the Matisse look a go, and here is my efforts. I added photos of our flowers from our garden that continue to bloom marvelously in our Australian summer heat. Today is 40 degrees Celcius. 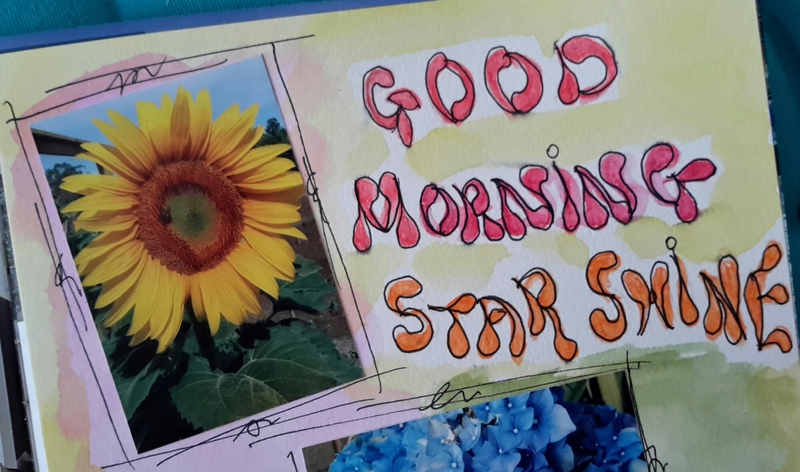 The words came from the musical Hair, “… Good morning star shine, the earth says hello…”. Background is watercolour. Words, I pencilled first, then drew over with watercolour pencil. After, I went over it with a brush dipped in water. Heat dried the watercolour and then outlined with black pen. I’m quite pleased with the creation. Thank you to Joanne and Nathalie! 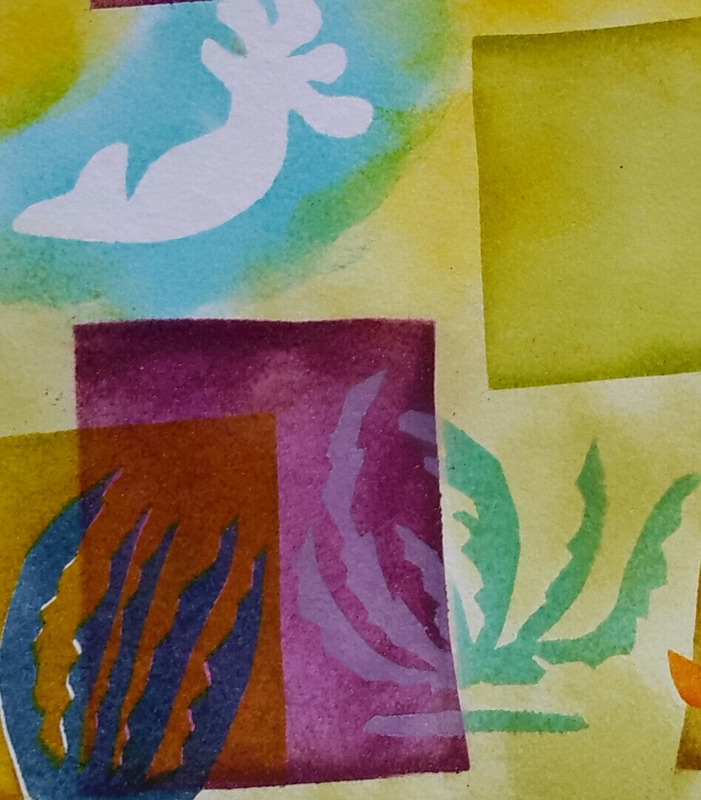 Third lesson with Nathalie’s Studio Creative Jump Start 2016 is with talented Michelle Ward illustrating her version of Matisse’s cut outs. She cleverly used spray can paint onto handmade stencils. It was such an experience watching her techniques. As I did not have spray paints, I tried with Tim Holtz Distress Spray Stains but did not get the results I wanted. I did manage to get lots on my hands though! 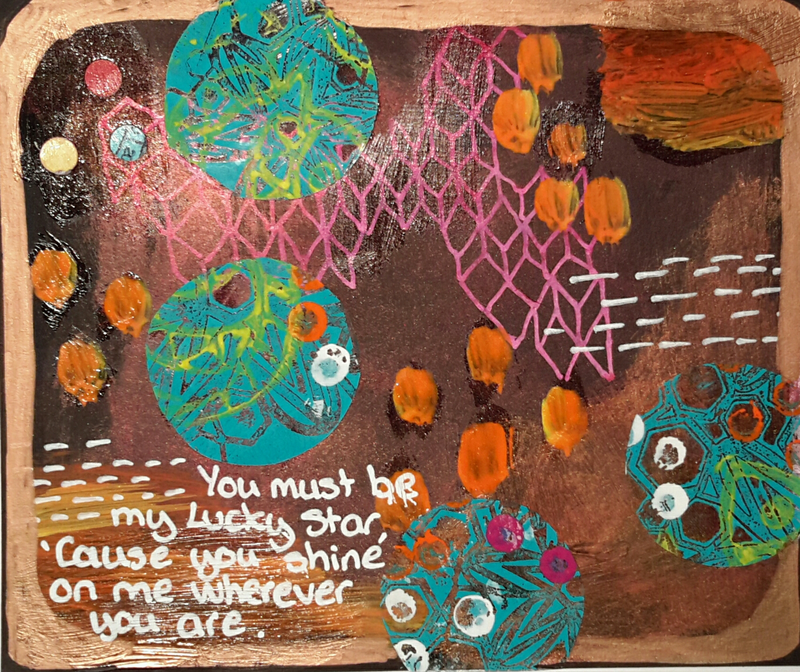 Next attempt was with Tim Holtz Distress Ink pads where I used ink blending foam and blended the colours onto the stencil. Much better! My stencils, I drew on paper first and then cut them out on acetate. 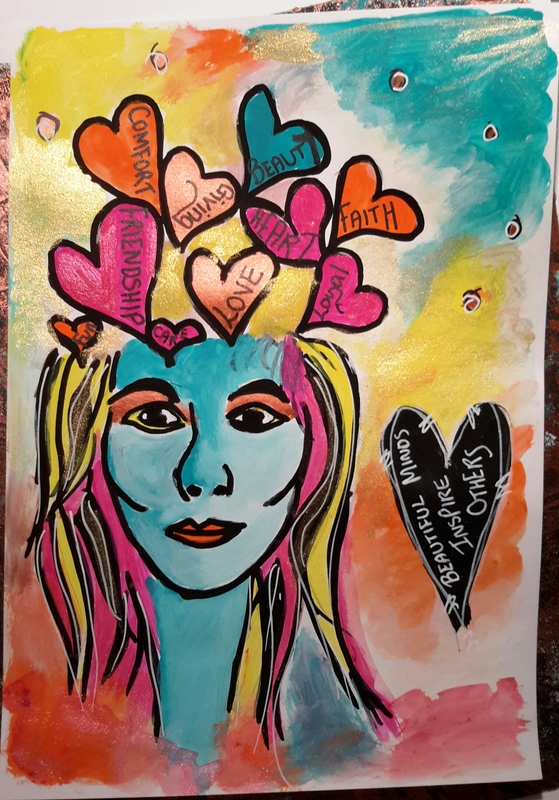 I just love the way you can overlap the stencils, partially paint them, and use both the positive and negatives of the image. I quite like the white shadow effect too. To cut the patterns, I used a stanley knife. Next stencil, I will design on the Funtime software and cut them out on the Blackcat Cougar cutting machine. http://www.de-signsmadebyme.com.au has more info on the cutting machine. Thank you Nathalie and Michelle! 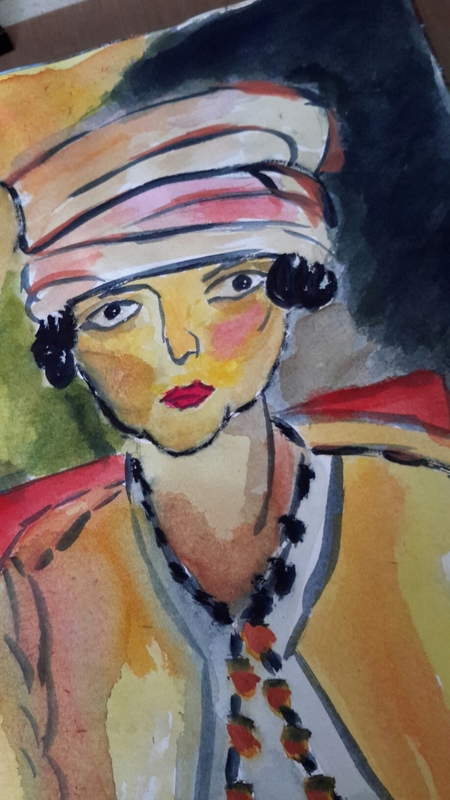 Second lesson was enthusiastically presented by Julie Fei-Fan Balzer, working with water colour. 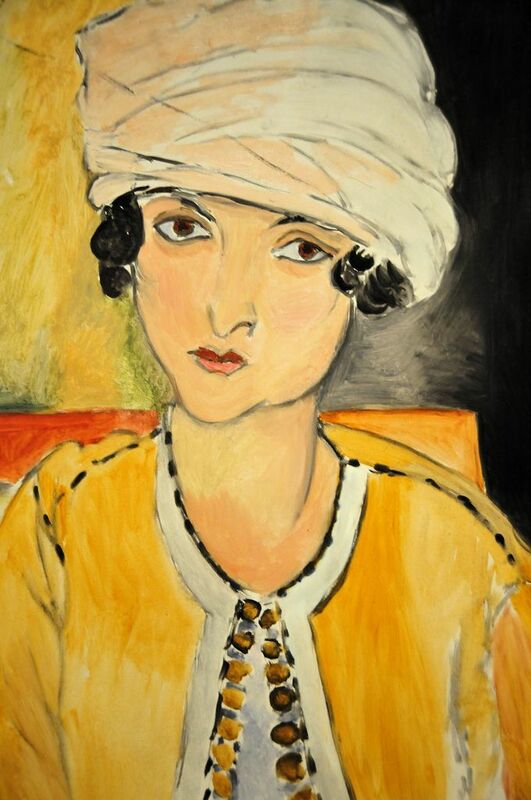 Again the theme is Matisse – Portrait of a Lady. 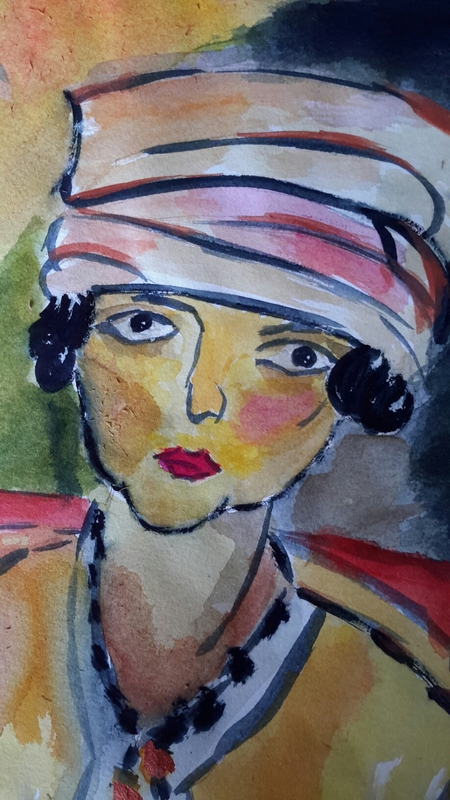 I have never properly painted with water colour, so this lesson just blew me away. I learnt heaps and saw how water colour reacts with the paper and how it can be manipulated to get the look required. It was fun mixing colours to get the hues I needed. 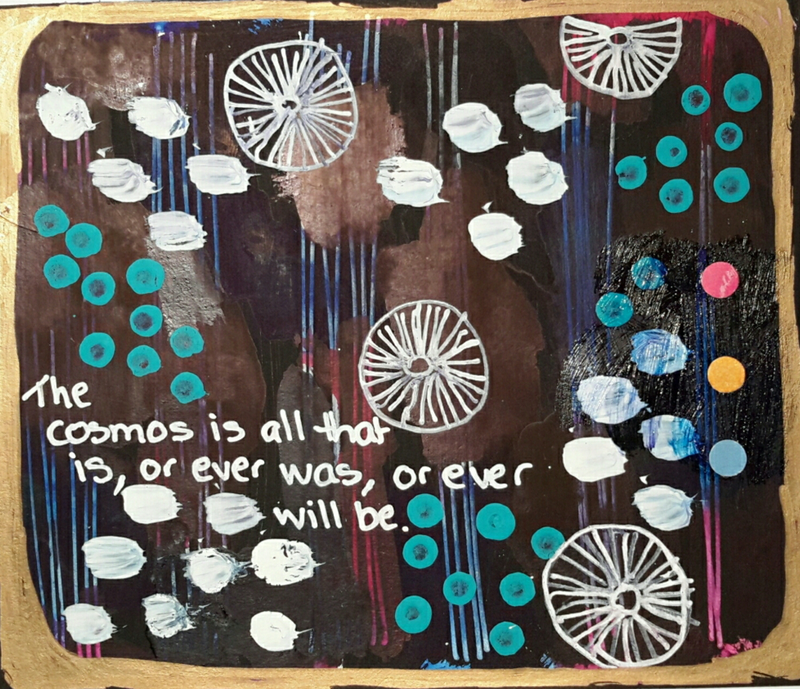 As I did not have the water colour sticks that Julie used, I used what I had. 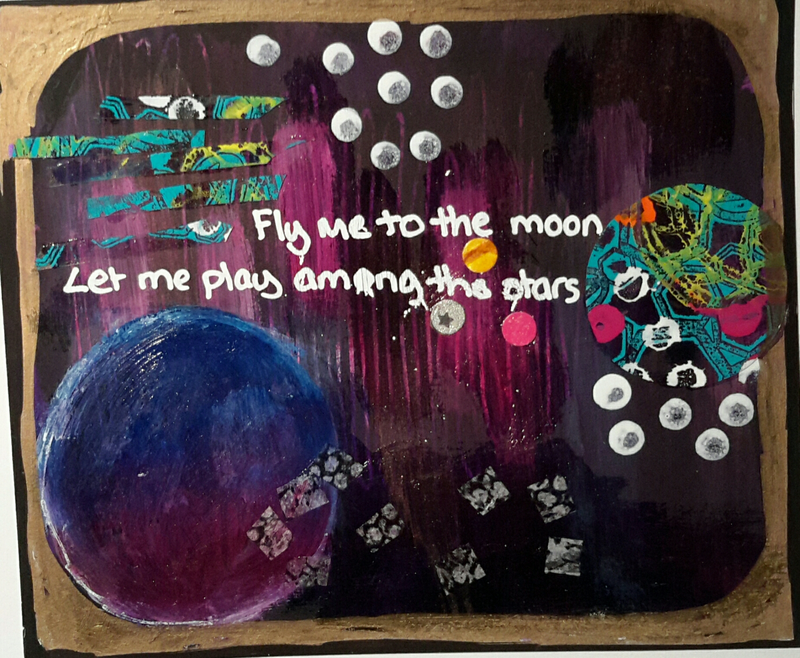 For my palette, I made do with a cake base plate that a friend brought for dinner which had a yummy cake on it! For a bit of bling, I used Jo Sonja’s acrylic Burnish Copper on the lady’s button and hat. Had lots of fun doing this! 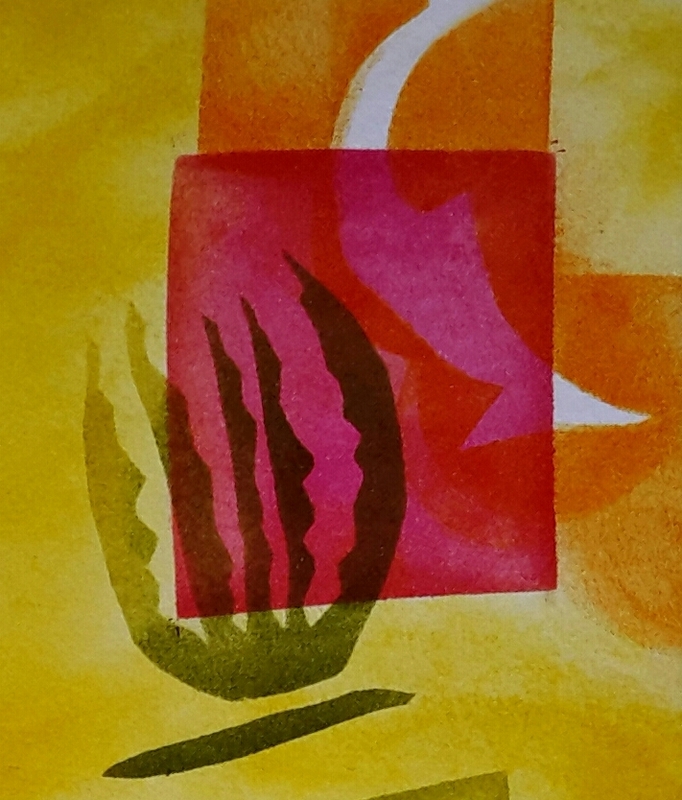 I enrolled at Creative Studio’s Creative Jump Start 2016 classes http://nathaliesstudio.com . 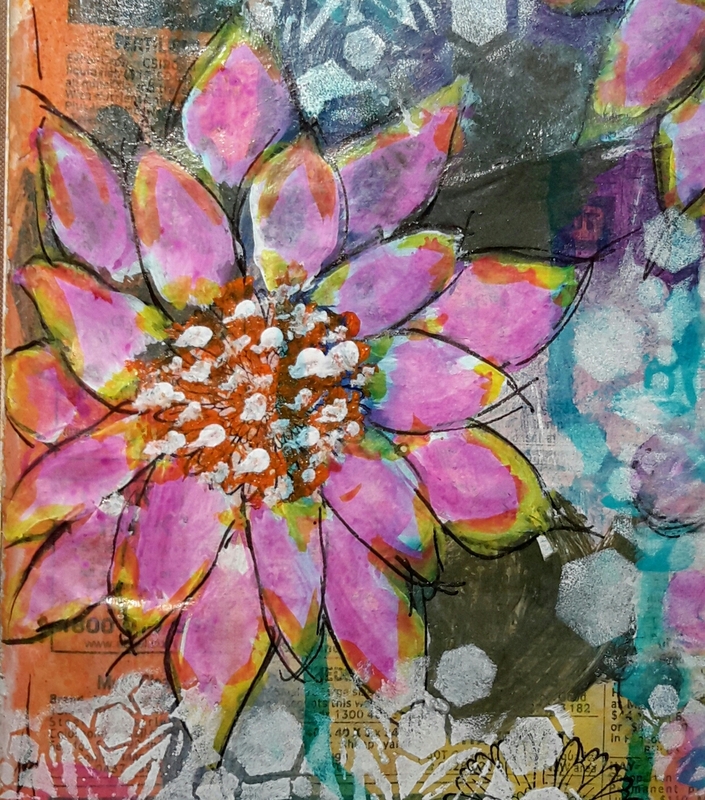 Classes teach you mixed media from a variety of paints & inks etc. I’m learning heaps from lesson one. All videos are downloadable and are step by step demos. So easy. Love my first attempt here. My art book, I am upcycling Harcourts Blue Book property guide. Background on page is covered with part of Weekly Times paper glued using Golden Gel Medium – Regular Gel. ✅ Monte Marte Two Seasons Acrylic Colour – Orange Red, Fast Light Yellow, Purple, Olive Green, Titanium White. 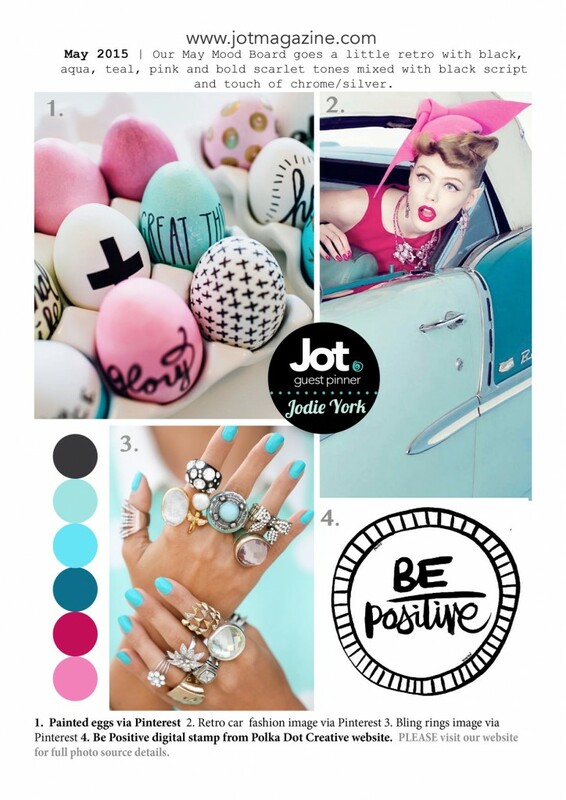 Jot magazine has a vibrant mood board challenge for November. I just love vibrant, happy colours. It inspired me to create a birthday card for my best, long time friend. I dabbed acrylic paint to a floral stencil. Painted some shimmer on green and pink parts. Applied a light media paste which I coloured gold through a tear drop stencil. Printed ‘Happy Birthday’ with an elegant swirl on a laser printer and gold foiled with my recently brought Minc. Added a sticker, ribbon and flower. Loving how it turned out. 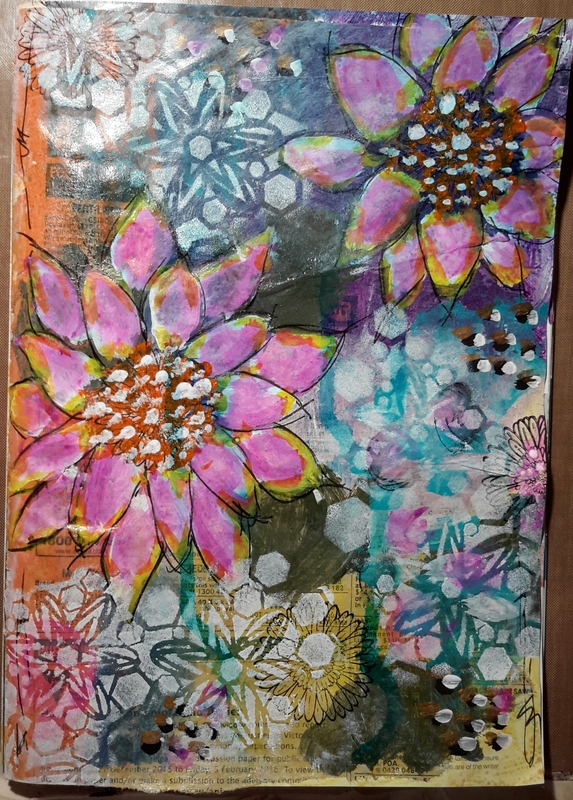 I am enjoying using stencils and experimenting with distress inks and acrylic paint. Thanks Jot Magazine for the mood board challenge. 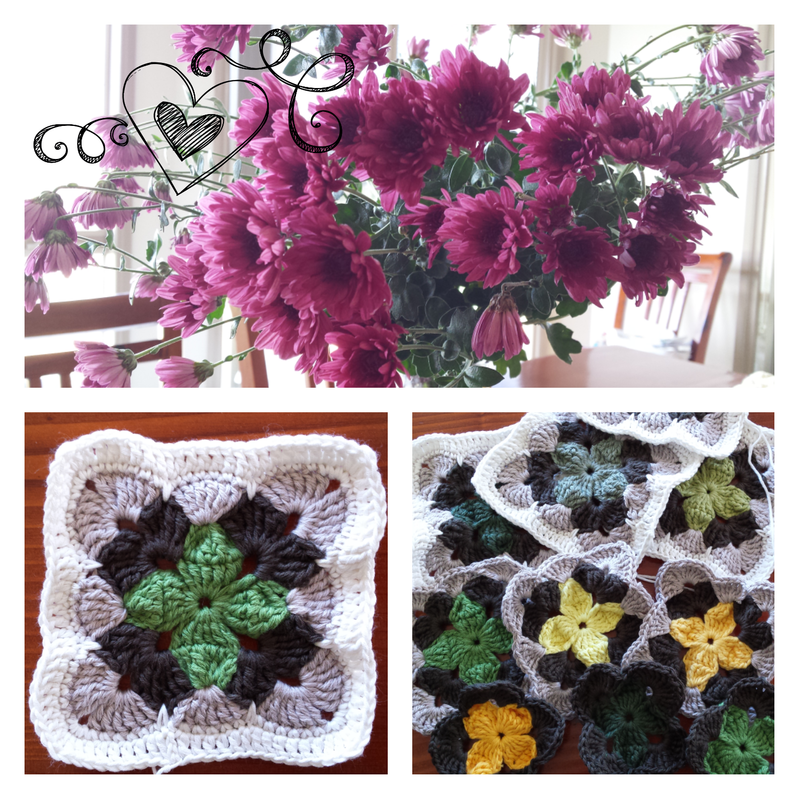 I was given the chance to help test the beautiful flower design by Nela of CrochetHome www.crochethome.wordpress.com . I fell in love with the pattern. You can press the flower flat or leave it scrunched up like I have done. I always wanted to make a bag and it ended up to be a bag to hold my crochet projects. 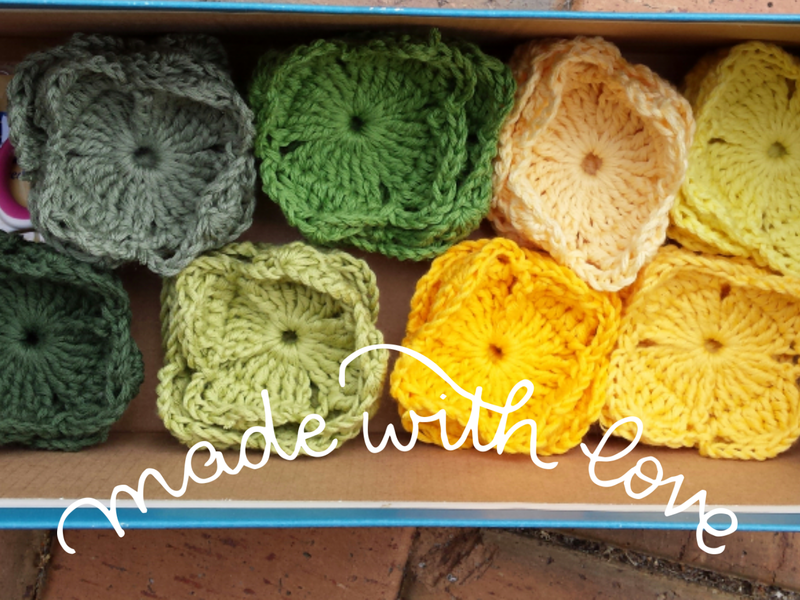 I used cotton from Bendigo Woollen Mills http://www.bendigowoollenmills.com.au . 4ply. I lined the bag with cotton material. So happy how it turned out. 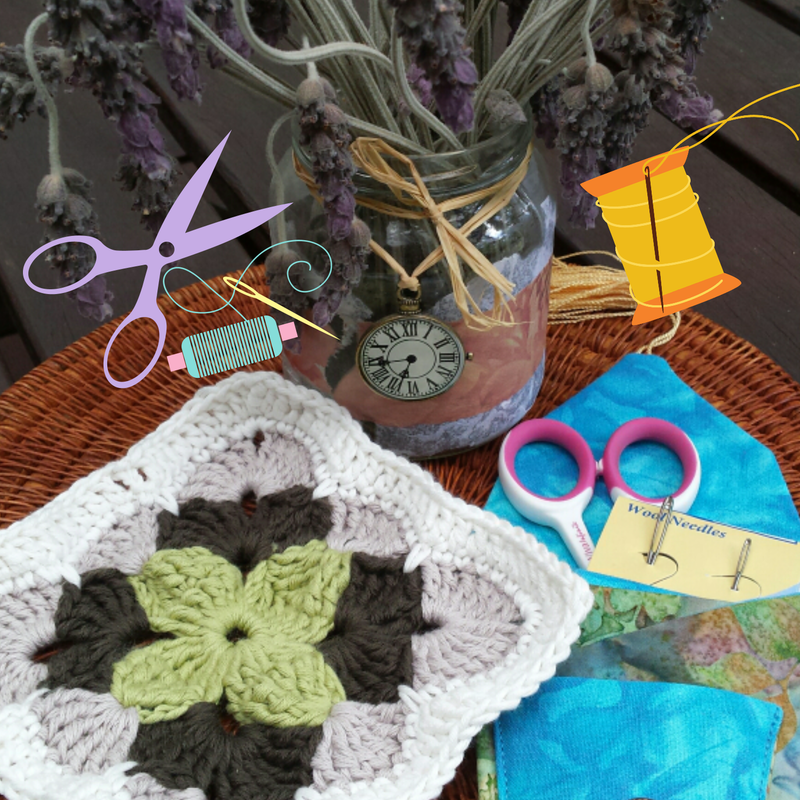 Thank you CrochetHome for allowing me to help test your flower. 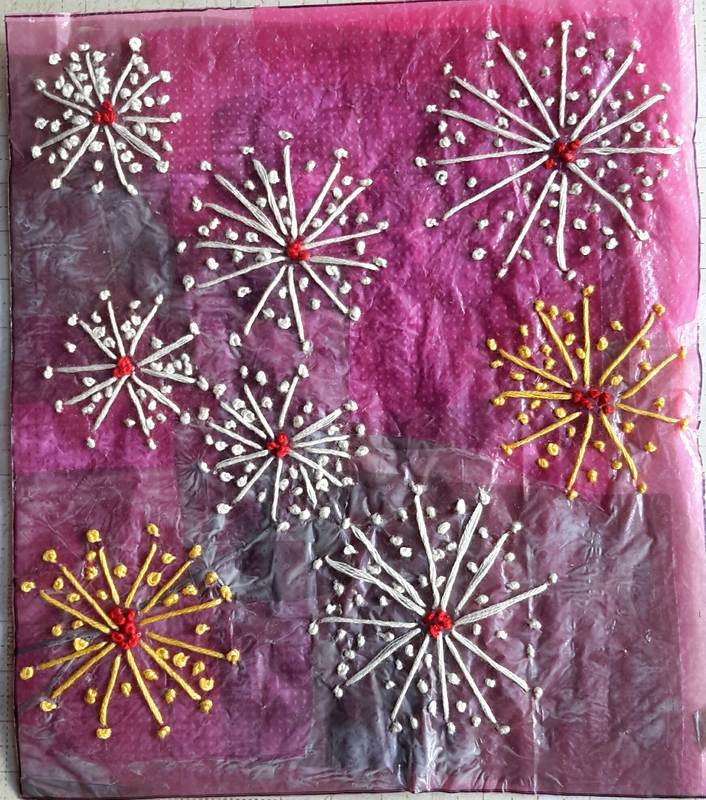 Follow Nela’s blog as she has some lovely projects with flowers and mandalas. Jot Magazine http://jotmagazine.com/may-2015-mood-board/ has. 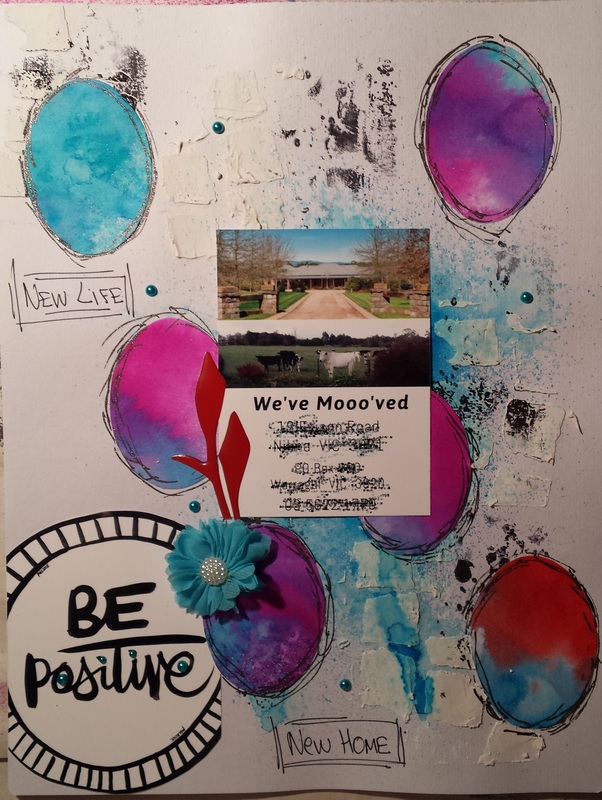 a great mood board for their May 2015 challenge. Loving the colours. So vibrant and bright. Here is my take on this challenge. My layout is on a white background, spritzing the card with water and applying Dylusions London Blue ink spray. 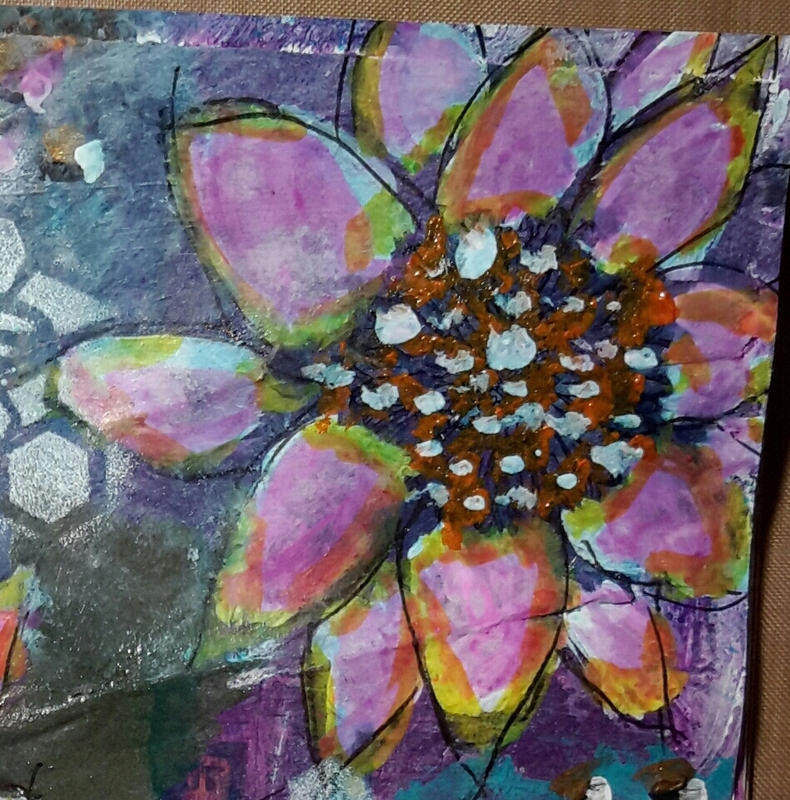 Then I added texture with Grunge Paste on a stencil. Stamped abstract pattern on top. The eggs are cut out from white thick stock that has been spritzed with water, sprayed with Dylusions Funky Fuchsia, London Blue and Distress Spray Stain Salty Ocean. Not forgetting a splotch of Barn Door. I then drew around the eggs to focus on it. We moved into our new home this year, different location, into the countryside, 15 acres. We wanted to get away from the city but still be accessible within an hour or so. New Home, New Life, New Adventures! Its been over 4 weeks now since we moved to our new home in the countryside of Warragul, and we are loving the atmosphere and the serenity … just like in The Castle, the movie! I have completed 31 white edged squares, 9 Beige and 13 Brown ones. Progress is good. I have crocheted while on the train from Melbourne to Warragul, in the car (as a passenger!) or in the evenings while relaxing. 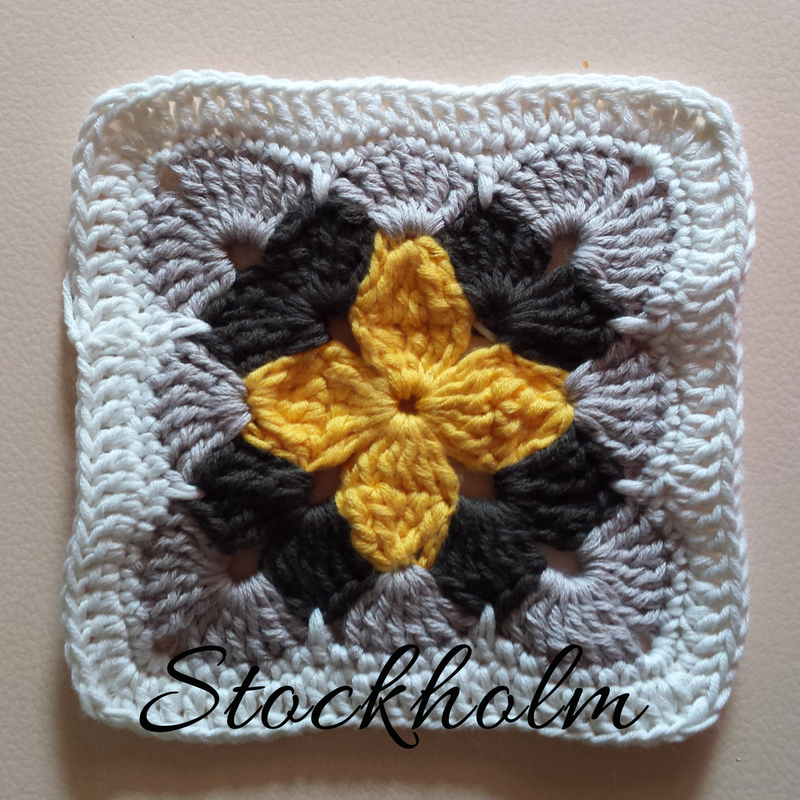 The previous owners have established a beautiful garden and I have included some flowers in the picture below with my Stockholm blanket project progress. I have now run out of Brown and Beige cotton and will need to order more. I can continue with the Cream squares and make more coloured squares in the meantime. I will either wait till I am in town to get more of those colours or order them online. As of today, my tally of squares is 48. Just on the half way mark for a throw blanket! Yeah! I love crocheting. 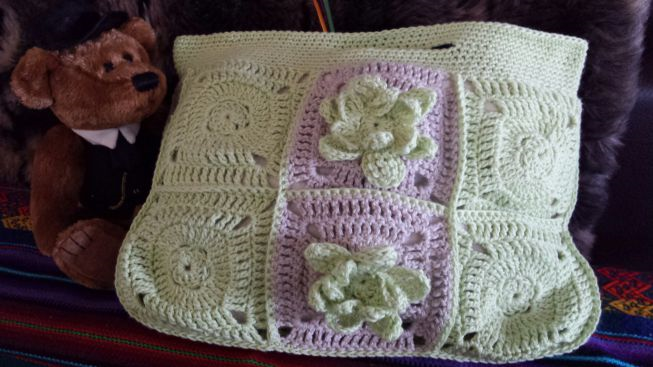 Its relaxing and lately have been crocheting during the evening and while the Australian Open tennis is on in Melbourne. So far I have worked out how far a ball of yarn goes for each stage of the Stockholm crochet project. 1 ball of Cream makes 8 squares. 1 ball of Dark Brown makes 14 squares. 1 ball of Beige makes 10 squares. Therefore I would need 12 Cream balls, 7 Dark Brown, 10 Beige. I have not yet worked out how many Greens and Yellows. I am so happy with progress made with One Crafty Mummas Stockholm crochet blanket. I am using Morris & Sons Avalon 8 ply 100% Pima Cotton, with 4mm crochet hook. One the brown and beige wool ball has gone, I can work out how much I need to complete my blanket for those colours. 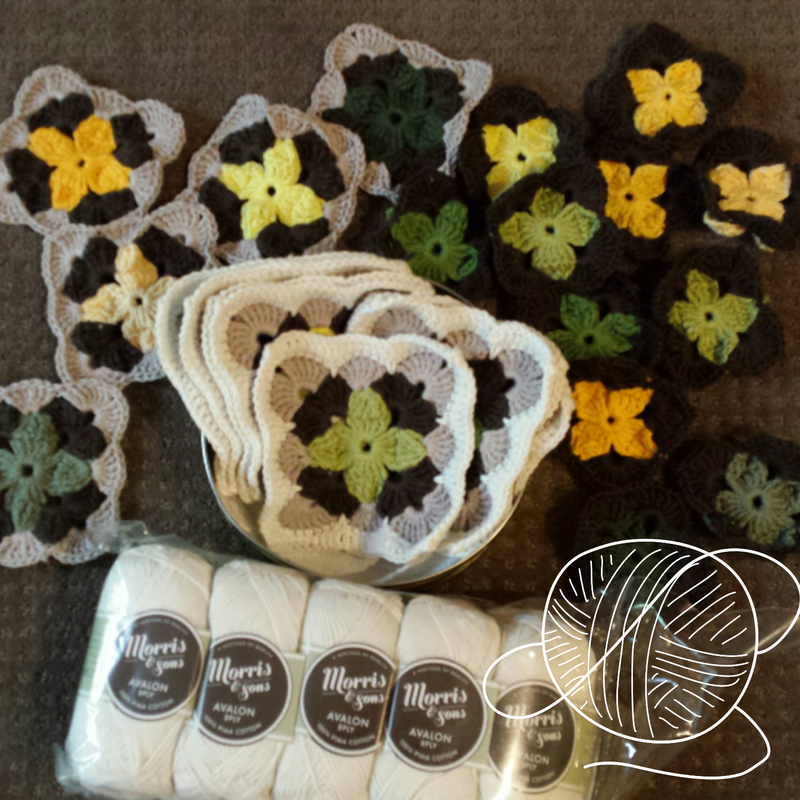 Check out Melissa’s progress on One Crafty Mumma’s blog. 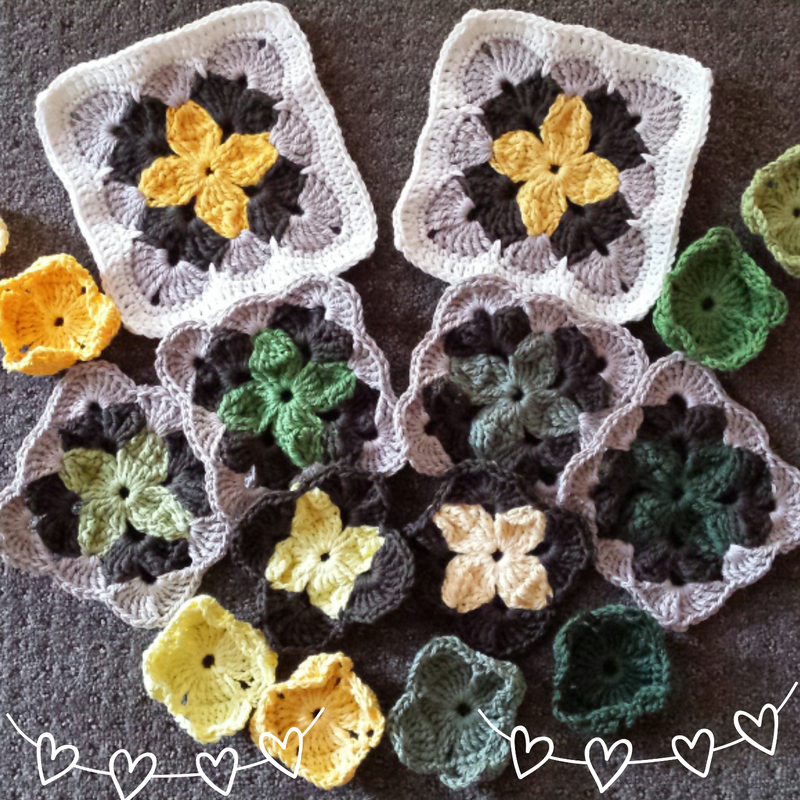 During the couple of hot days in Melbourne, there is not much you can do but stay inside and crochet! I now have 25 colourful squares inspired by One Crafty Mummas Stockholm blanket project, and also made up a completed square to gauge how big each square will be. Its approximately 14 X 14cm square, and I think I will stick to the colour scheme here but with each centre design a different colour. Last night I sewed up the dangly bits of yarn of each coloured square so its neat when I finish off each completed square. I think my method for this blanket at the moment is to make up the centre colours first in batches, then sew up the yarns. Once in a while, make a complete square. For my completed project, it would be nice to have a 140 X 140cm of squares plus the border. This would mean that I need 10 rows and 10 columns of squares, therefore 100 squares. It should cover a queen size bed. Otherwise a nice throw blanket on the couch that measures 120 X 180cm in total which is approximately 8 rows and 12 columns minimum plus border, therefore 96 squares..
Coloured pieces are kept in a shoe box. Once there is more completed squares, I will need to keep them in a bigger box. I love taking photos with my smartphone as it is convenient at times. I found a great app, Photofy, which you can enhance your photos with text, frames, etc. Easy to use and fun! A free app and you can purchase designs or use the freebies. Design on your smartphone once you have captured your photo.